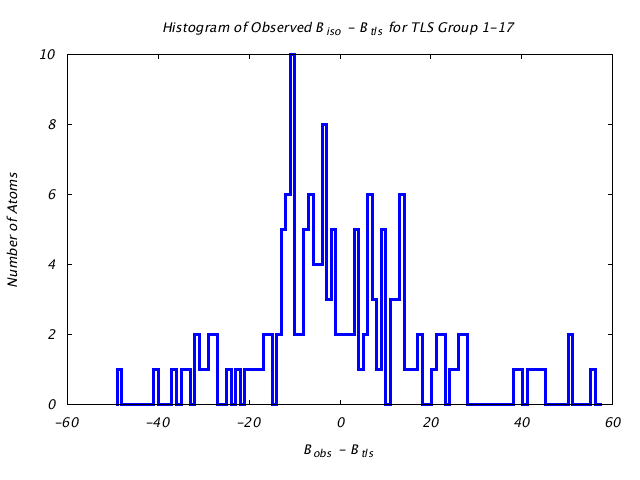 Comparison of TLS predicted B factors with experimental (input) B factors. 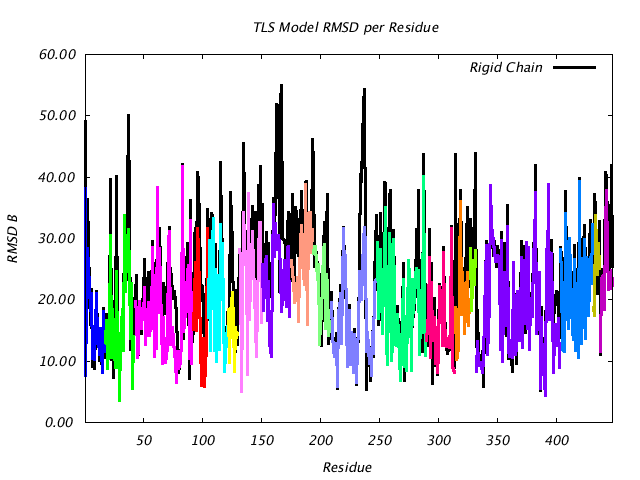 The TLSMD optimization algorithm models TLS groups as sequential segments of a protein or DNA/RNA chain. 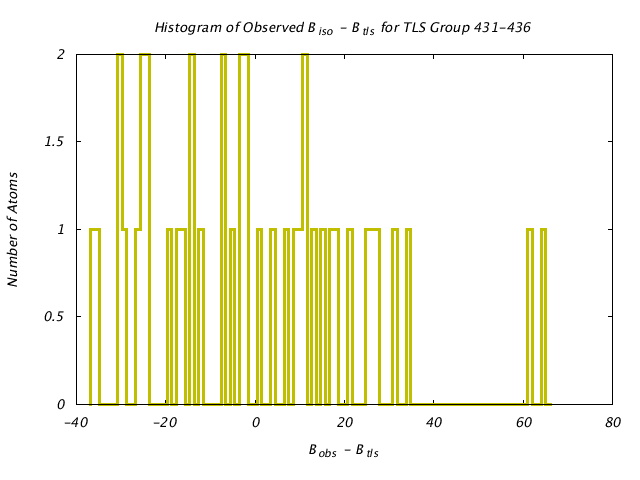 This matrix shows the RMSD B values of the individual groups on the diagonal, and the RMSD B values of combined groups as off-diagonal elements. 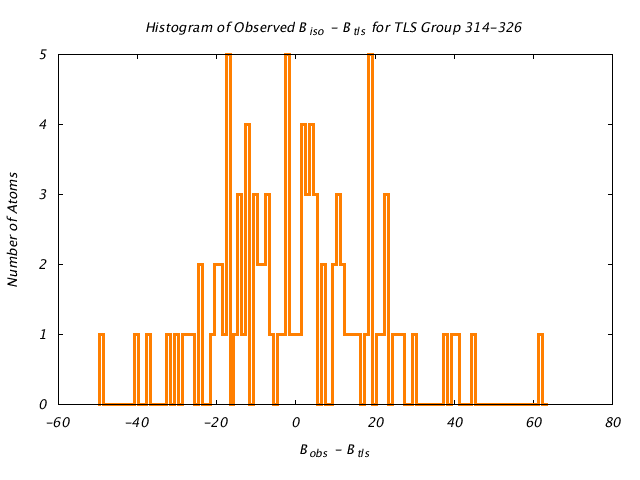 This helps identify non-contiguous protein segments which may be combined into a single TLS group. 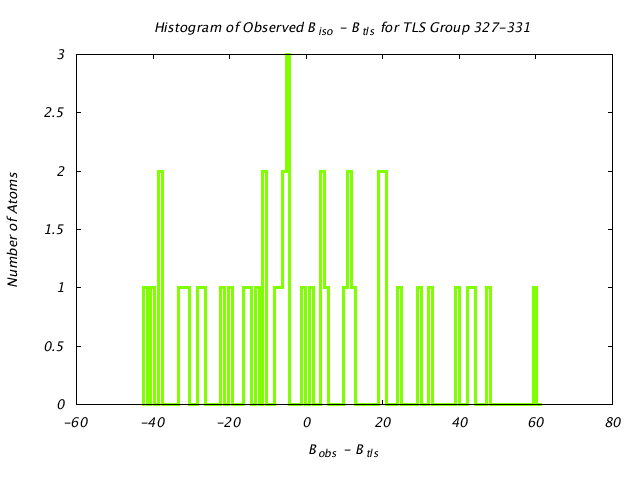 This graph shows the TLS group translational displacement magnitude of the three principal components of the reduced T tensor at a isoprobability magnitude of 85%. 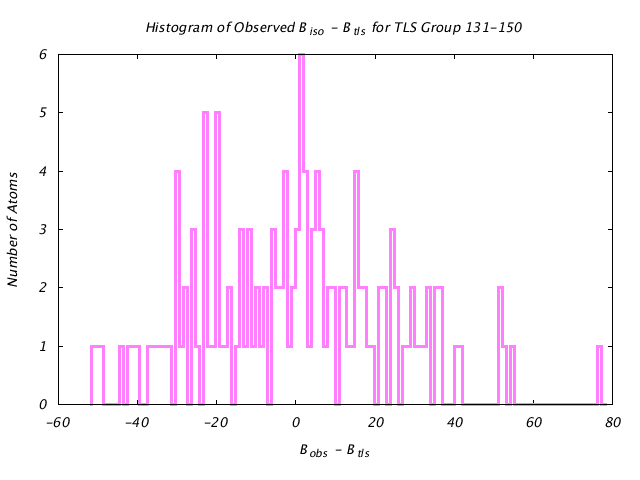 The line colors are the same as those used for the TLS groups in the various structure visualizations. 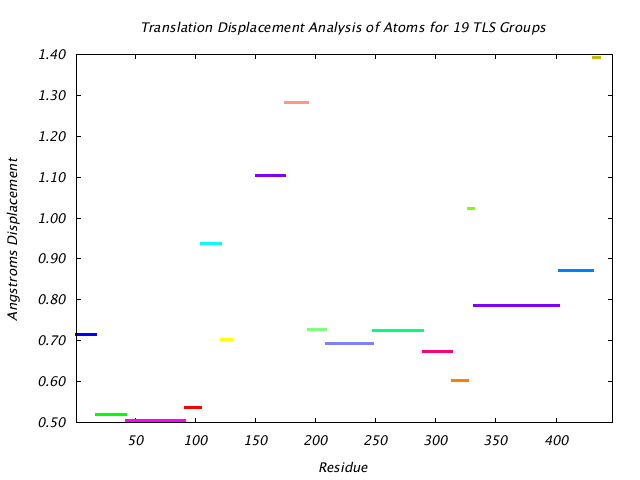 This graph shows the displacement of main chain atoms implied by the three screw axes of the TLS group to which they belong. 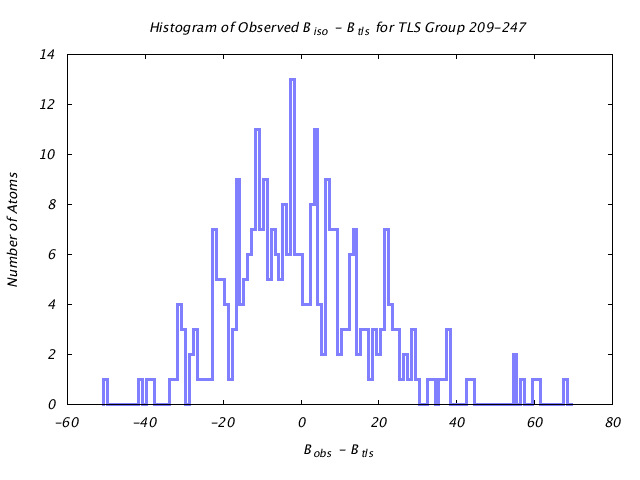 The screw displacement axes are calculated in terms of a Gaussian variance-covariance tensor, and displacement magnitude is shown at a 85% isoprobability magnitude like the translational displacement. 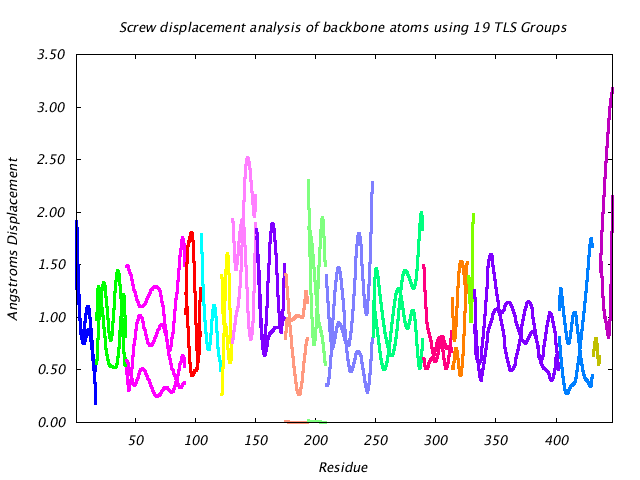 Protein segments undergoing hinge-like motion show up as peaks in this graph. 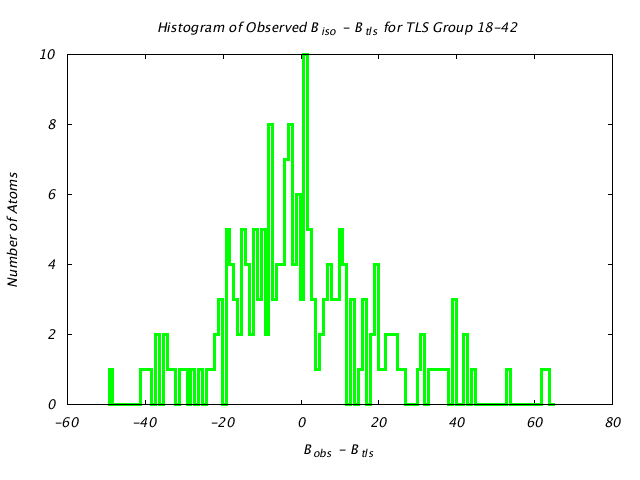 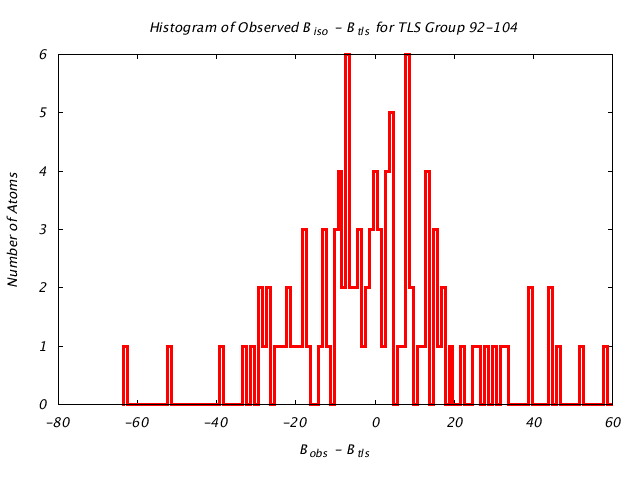 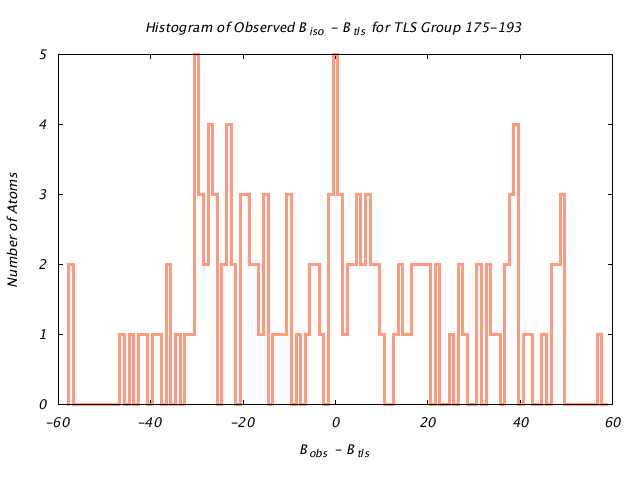 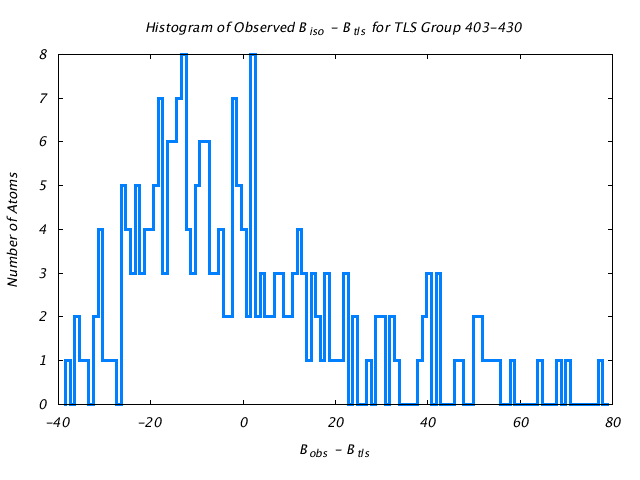 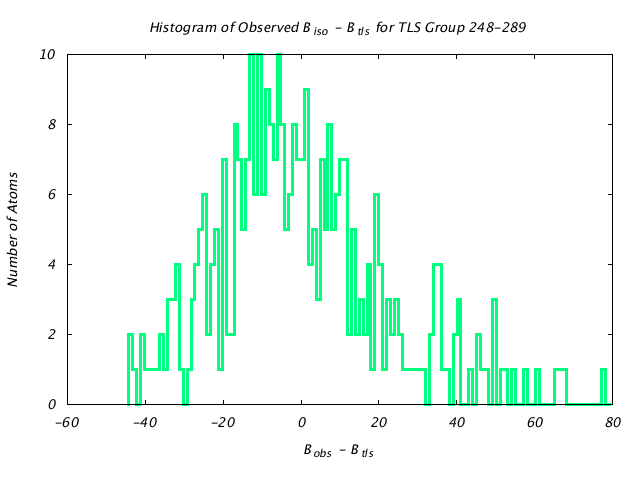 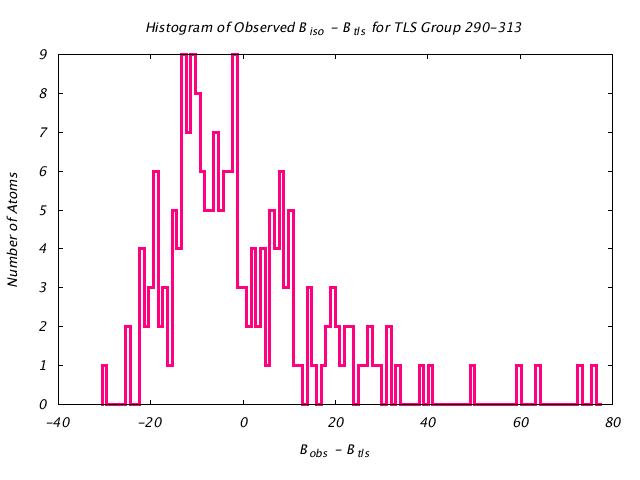 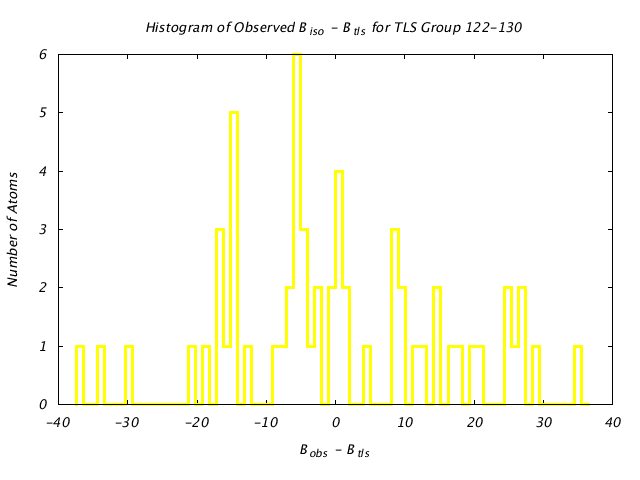 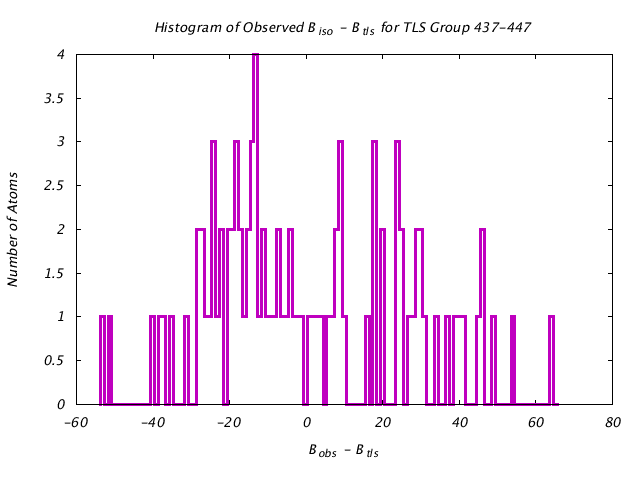 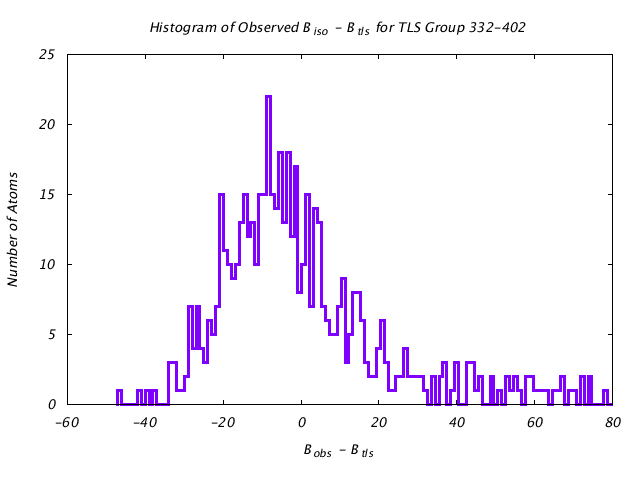 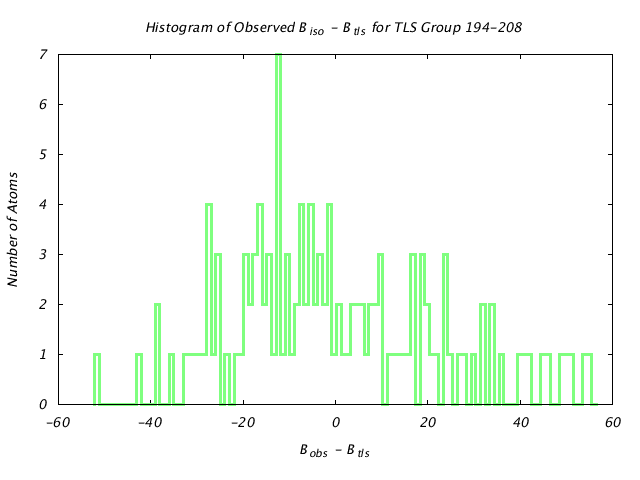 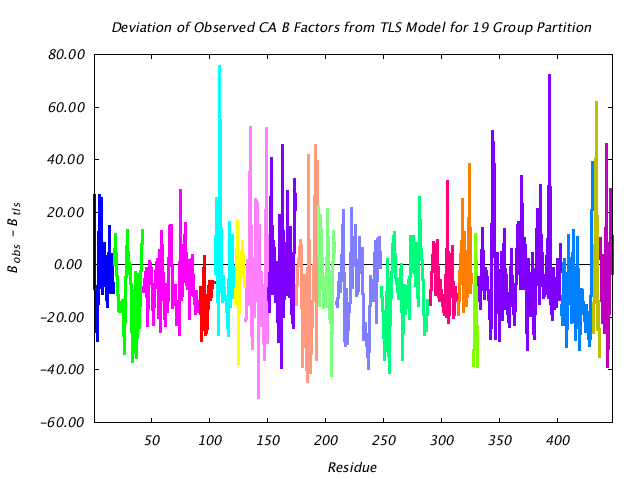 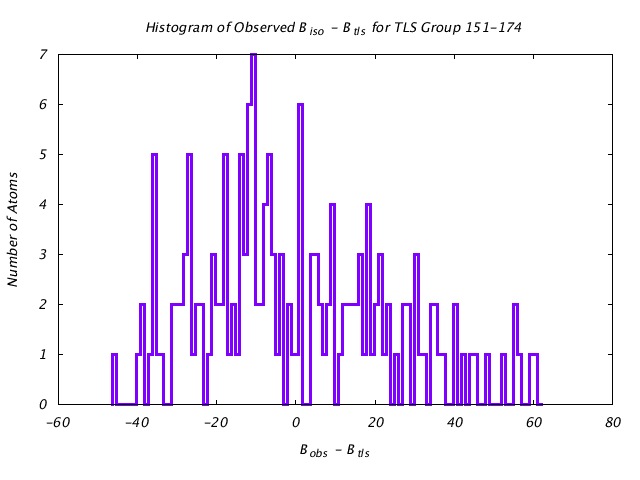 This graph assesses the quality of the TLS prediction for each residue by graphing the difference between the refined (input) main chain atom B factors and the corresponding B factors implied by the TLS model alone. 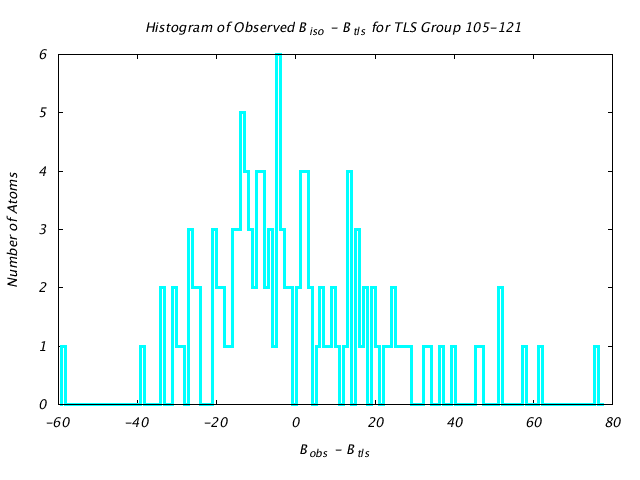 If the TLS model were a perfect description of the observed thermal motion described by the input structural model, this plot would consist of a line at 0. 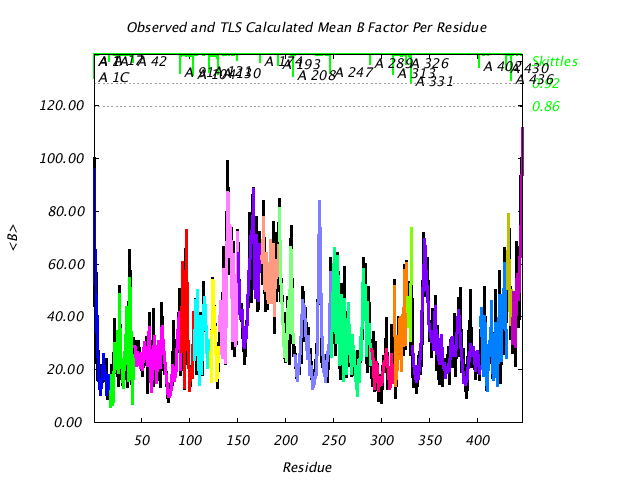 This plot is similar to the plot above, except that instead of plotting (Bpred - Bobs) for the CA atom only, the colored line plots the RMSD of |Bpred-Bobs| for all atoms in the residue. 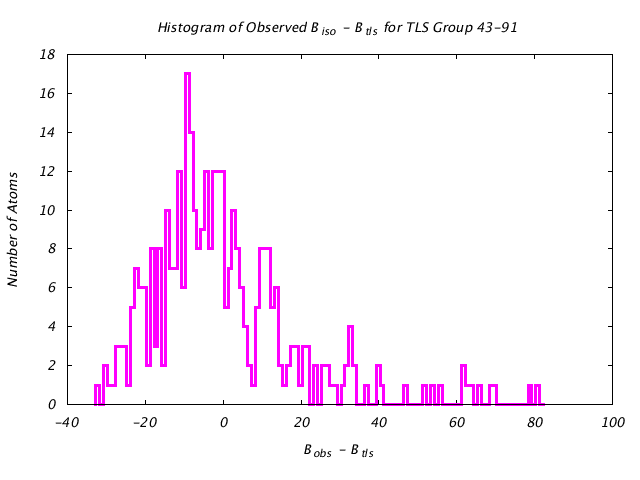 If the TLSMD model were a perfect description of the input B values, then the colored line would be a horizontal line at 0.